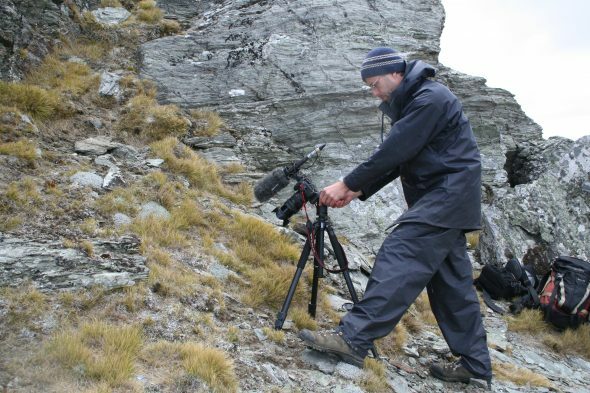 In December 2014, three Te Papa Science Staff embarked on an 11 day field trip from Otago to North Canterbury. 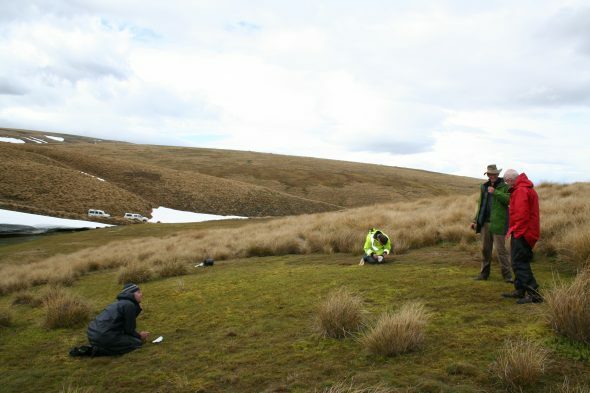 Heidi Meudt – Botany Researcher, Phil Garnock-Jones – Botany Researcher and Antony Kusabs – Collection Manager Sciences collected specimens, images and DNA samples of native forget-me-nots (Myosotis) and New Zealand hebes (Veronica). 11 days, over 3000 km travelled and 114 specimens collected, including 19 forget-me-nots and 29 hebes… How did we do this? What were our days like? Here is a short diary of our trip with some photos of us, in our preferred habitat. Ready? Let’s get this field trip started! 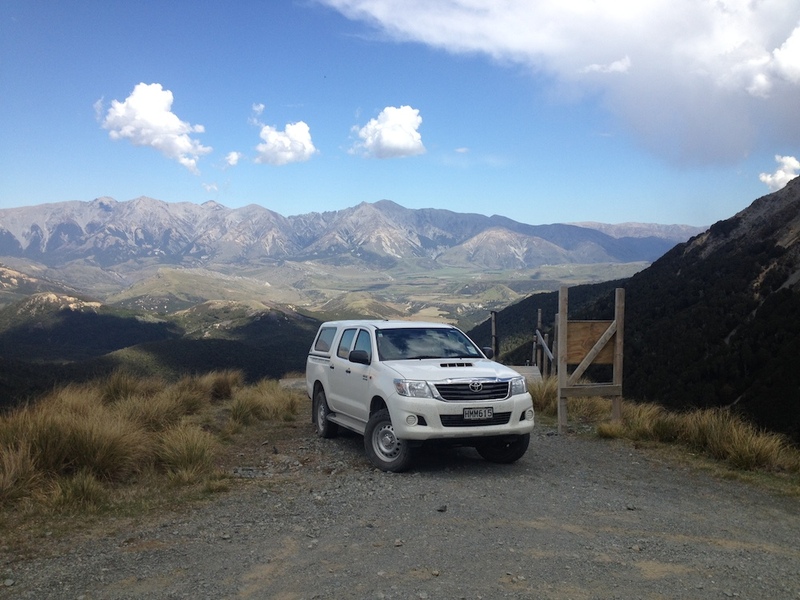 Day 1 – A looooong travel day to Central Otago. 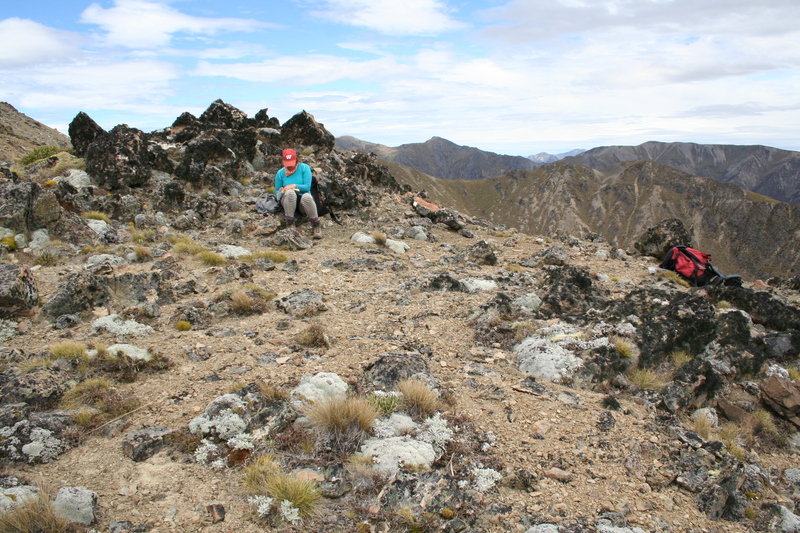 Day 2 – Old Man Range. The first day of field work! We are excited to get out there. We meet up with conservation biologist and fellow forget-me-not enthusiast Mike Thorsen, who will join us for the next few days as we botanise in Central Otago. 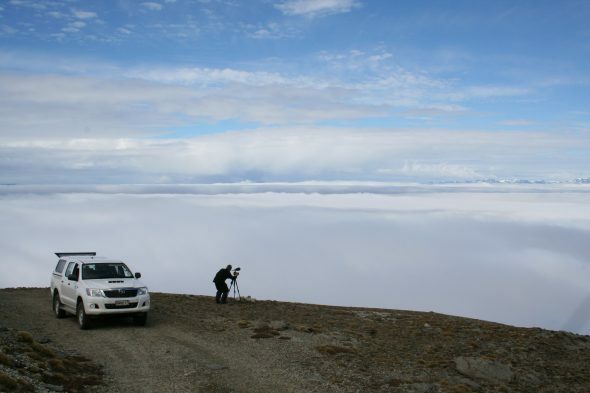 We drive the 4WD up to the tops of the range, meet up with one of the local farmers who is interested in our work, and make our first scientific collections of the trip. Finally in the field: Ant Kusabs, Kerry Jones, Mike Thorsen and Phil Garnock-Jones searching for forget-me-nots in the Old Man Range. Photo by Heidi Meudt © Te Papa. 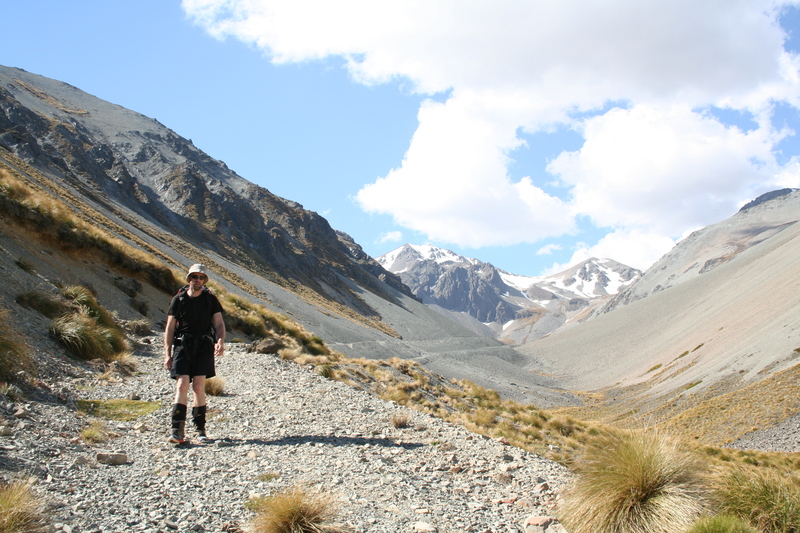 Days 3 and 4 – Dunstan Range. We have the privilege of spending not one but TWO full days in the southern part of this range. 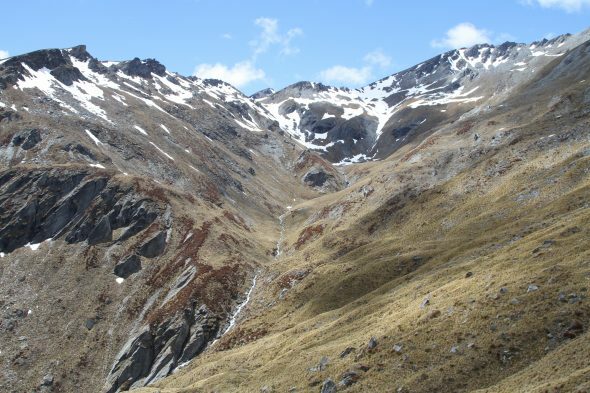 It is stunning high country, and we have good luck finding the forget-me-nots and hebes too. So far we are spending about 10-12 hours a day in the field, and then (after showers and preparing and eating dinner!) another 2 hours processing our samples in the evenings, and planning the next day’s adventure. Botanising on the edge: Morning in the Dunstan Range. Photo by Heidi Meudt © Te Papa. 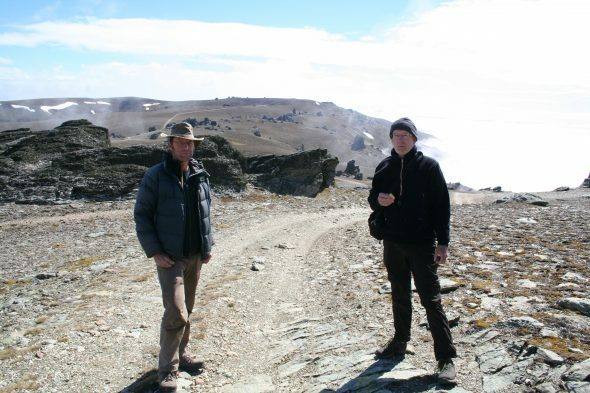 Ready for the hunt: Mike Thorsen and Phil Garnock-Jones are about to find some forget-me-nots and veronicas in the Dunstan Range. Photo by Heidi Meudt © Te Papa. 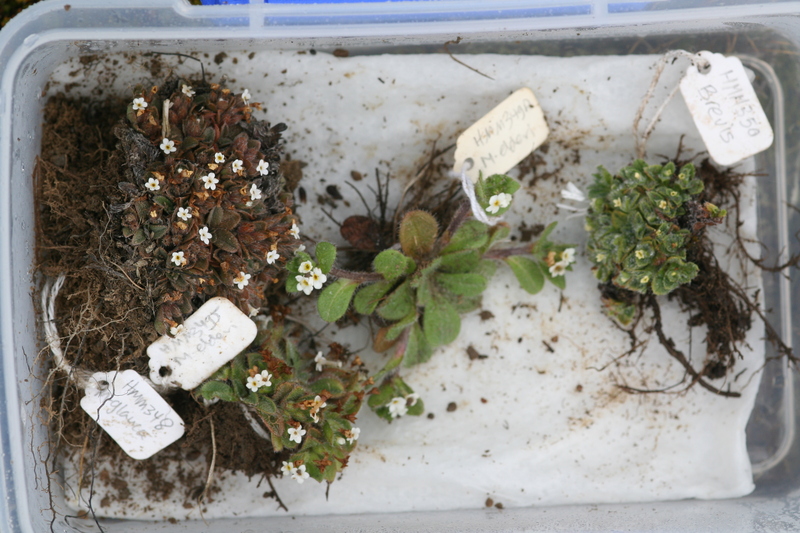 Box of botanical treasures: Here are some of the forget-me-not specimens we collect in the Dunstan Range. We place them in this plastic box with a moist paper towel for safe keeping during the day until we press them later in the evening. Photo by Heidi Meudt © Te Papa. Forget-me-not footage: An important part of collecting is getting images for Collections Online. Ant Kusabs is here filming and photographing the rare Myosotis albosericea in the Dunstan Range. Photo by Heidi Meudt © Te Papa. 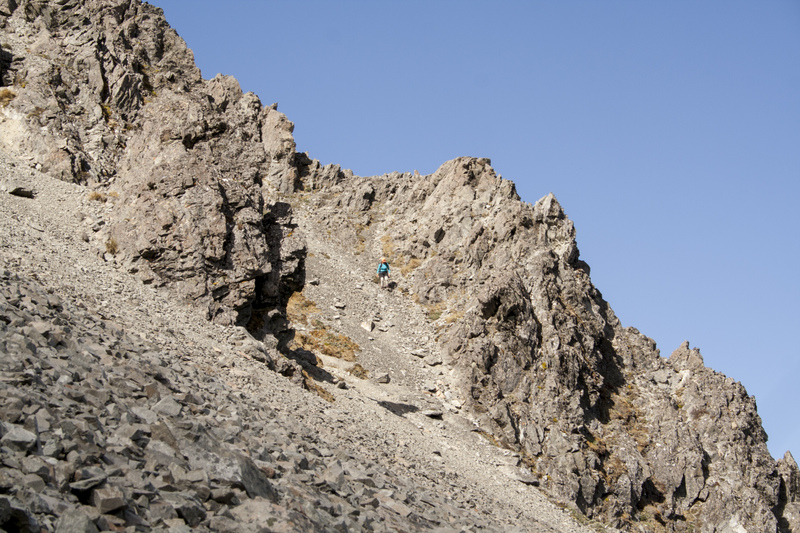 Day 5 – Hector Range. This is off the beaten track. Ant, Mike and I have to rely on our own legs to get us up and back down the mountain today–in all, a massive 12 hour tramp carrying all our gear, lunch and water in our packs. 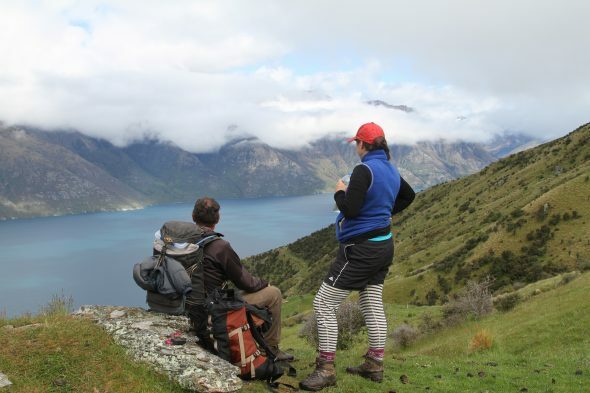 The lovely folks at Loch Linnhe Station near Lake Wakatipu generously allow us access to the tops to botanise, and the scenery is stunning. By the end, we are knackered, and even worse: we don’t the forget-me-not we are looking for (M. glabrescens, which has been collected there before)… But Phil comes to our rescue when we get back to our accommodation around 10 pm, waiting up for us with a lovely homecooked dinner. Great views from the office today: Mike Thorsen and Heidi Meudt above Lake Wakatipu during our Hector Range tramp. Photo by Ant Kusabs © Te Papa. Great views, take two: Staircase Creek in the Hector Mountains. Where are the forget-me-nots here? We are unsuccessful in finding them today. Photo by Ant Kusabs © Te Papa. Day 6 – Travel day. We sadly say haere ra to Central Otago and also to Mike, and drive north, towards Canterbury. On the way we find some interesting weeds. To be honest it is good to give our legs a rest today, because tomorrow is another big tramp. Day 7 – Mt Torlesse. Today’s goal: Find the forget-me-nots at the top (1961 m above sea level). The day starts out well: we find Myosotis australis and two species of Veronica in the valley. Ant stays behind to collect those while Phil and I start the big ascent. At the top (we finally make it!) we find a few individuals of Myosotis traversii and Veronica, but not much else. It’s quite barren up there, and for us botanists, pretty disappointing. We’re still smiling though. Finally: Here I am using an identification key to help me determine that the plant just below the GPS by my left knee is Myosotis traversii. Can you see it? Photo by Phil Garnock-Jones © Phil Garnock-Jones. 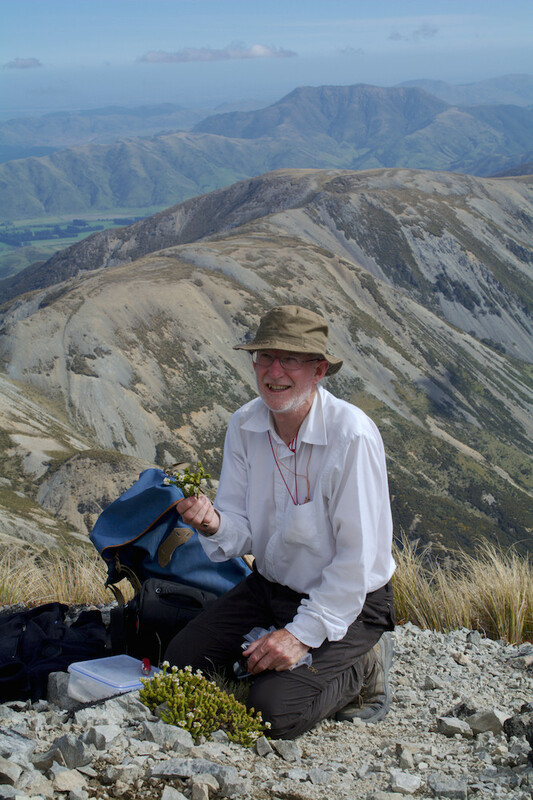 Happy botanist: Phil Garnock-Jones collecting a specimen of Veronica epacridea on Mt Torlesse. Photo by Heidi Meudt @ Te Papa. Day 8 – Mt Potts. This time Phil stays behind to catch up on some photography, while Ant and I walk up the old 4WD track to the ski field area. Near the tops, we find a beautiful tarn and make collections of an intriguing forget-me-not growing in a mountain stream and a cushion snow hebe (Veronica pulvinaris). Before returning home, we stop to make some quick collections of Myosotis uniflora, a cushion species from Canterbury river plains, before the sun goes down. After dinner (thanks Phil!) and specimen processing, another long but successful day comes to an end. Ant Kusabs walking along the old 4WD track, with Mt Potts in the background. Photo by Heidi Meudt © Te Papa. 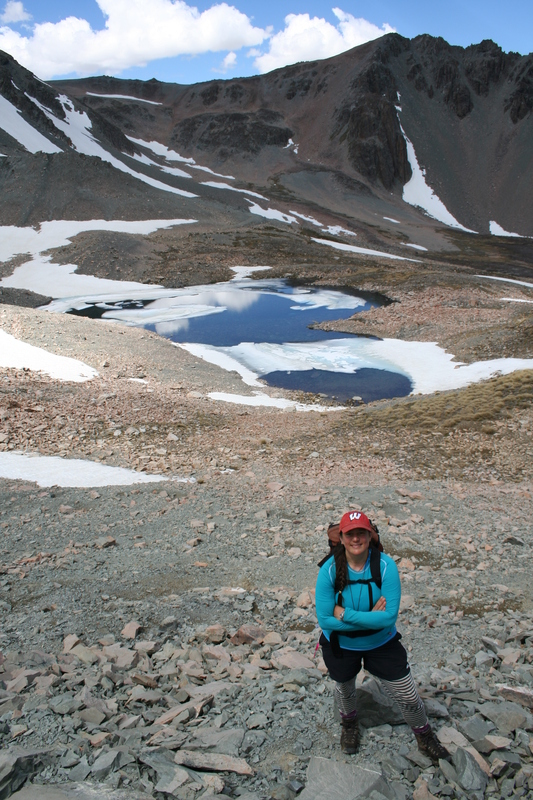 Perks of the job: Here I am by a partially-frozen tarn near Mt Potts. A beautiful site, but not a lot of plants growing up here. Photo by Ant Kusabs © Te Papa. Needle in the haystack: Searching for (and finding!) cushions of Myosotis uniflora along the dry riverbeds of the Ashburton River at dusk. Photo by Ant Kusabs © Te Papa. Day 9 – Craigieburns. 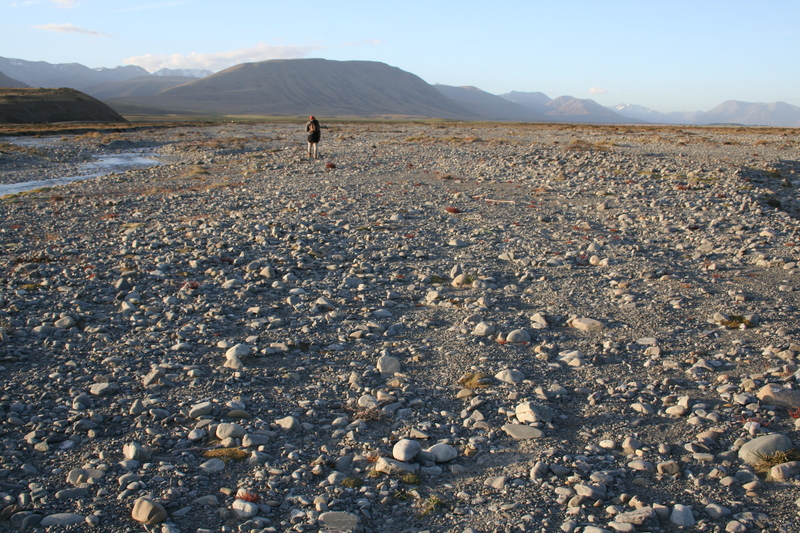 In the morning we collect from another Myosotis uniflora site along the Waimakariri River before heading to Broken River Ski Field. Even though we scour the scree and rocky cliffs–all potentially good habitat–we do not find any forget-me-nots there. After a few other brief stops, in the late afternoon we drive to our last stop, Hanmer Springs. 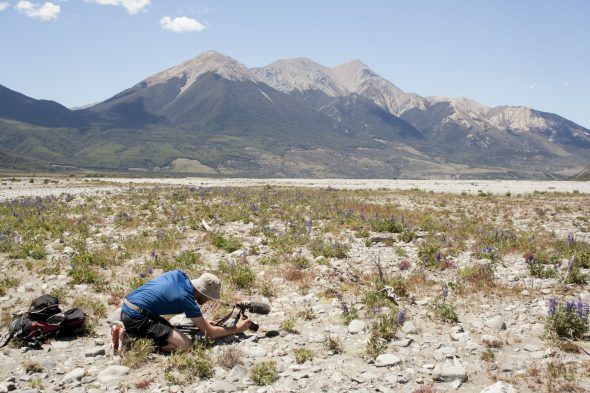 Another perfect morning: Here is Ant Kusabs filming a second population of Myosotis uniflora, this time in the Waimakariri River beds. Photo by Heidi Meudt © Te Papa. Car park with a view: We leave the vehicle here and walk the rest of the way to Broken River Ski Field. Photo by Phil Garnock-Jones © Phil Garnock-Jones. 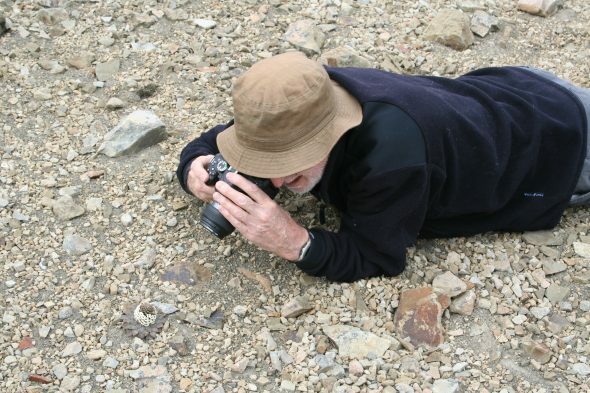 Do not show this photo to my mum: Here I am searching the steep rocky crags and scree for forget-me-nots. 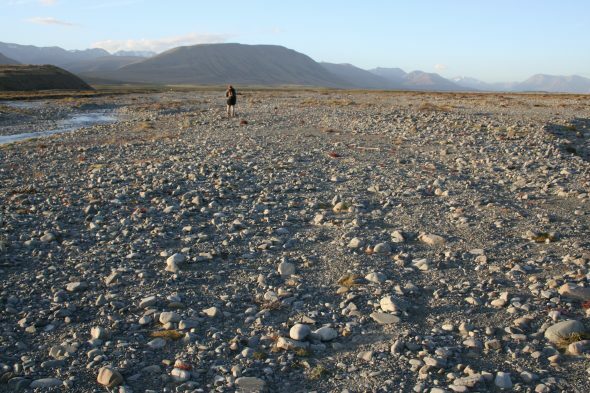 They have been collected here before by other botanists, but unfortunately we do not find them today. Photo by Ant Kusabs © Te Papa. Phil and the penwiper plant: There are so many of these Notothlaspi rosulatum (yes, I spelled that correctly!) plants at Mt St Patrick that we have to be careful not to step on them! Here is Phil photographing one of them. Photo by Ant Kusabs © Te Papa. 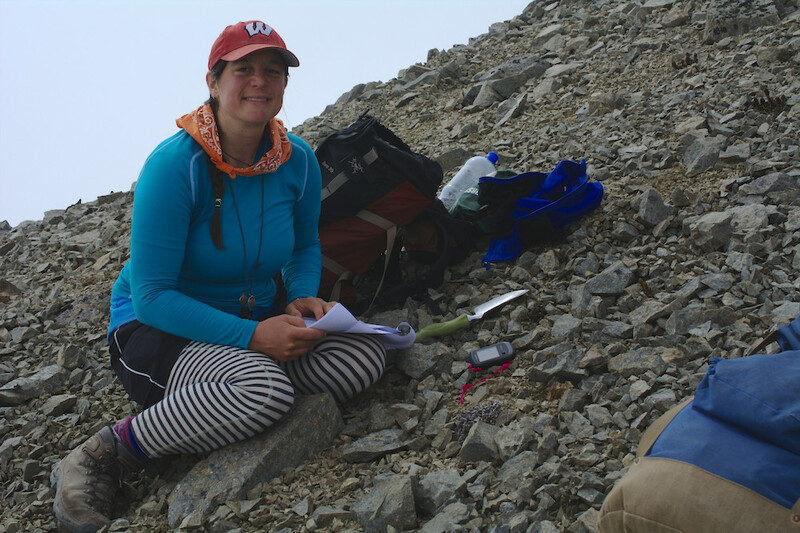 Botanical heaven: Sitting down to collect forget-me-nots and document the precise GPS location, habitat, elevation, plant characteristics and associated plants seen at the site. There are so many interesting native alpine plants here, the last collecting locality of our South Island trip. Photo by Ant Kusabs © Te Papa. Thanks to the Department of Conservation and landowners who supported us and helped make our field work possible. what an amazing adventure. i am jealous:) what fabulous work you guys do! Thanks Sherry! We feel very fortunate to be able to do this kind of work, too.